Legs can be be cut to length to allow for different mounting positions. Heavy duty design can take a pounding from the rocks while keeping body damage to a minimum. Strong enough to take the entire we..
Our gusset kits include plates for the frame and triangle corner gussets. Plate welds to frame and rock slider welds to plate. 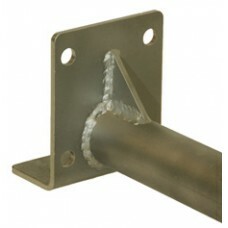 Kits are made from 3/16" plate steel. 58" and 67" kits contain 6 plates a..
Rock sliders are a great way of protecting the rocker panels. Trail-Gear has designed its Rock Sliders to be the strongest on the market, starting with 1 3/4" OD x .120 wall 1035 DOM. Trail-Gear Rock..
Trail-Gear gusset kits include plates for the frame and triangle corner gussets. Plate welds to frame and rock slider welds to plate. Kits are made from 3/16" plate steel. 58" and 67" kits contain 6 p..